Homemade 15 MINUTE Strawberry Peach Jam recipe that makes a small batch 8 oz jar without pectin! This healthy, easy recipe is a low sugar jam made with honey that makes a perfect jam for toast, dessert and more. I love canning this recipe too! So instead of making my usual strawberry jam, I decided to give it a peach twist! The outcome is delicious! And the smell! It smells like Summer! My favorite jam recipes are quick. I don’t like hanging out over the stove for 2 hours stirring jam in the Summer. This recipe is quick and is ready in 15 minutes including preparing and cooking. Berries that have exotic colors are usually rich in antioxidants, and strawberries are no exception to that! Strawberries are proven to help eye care, they boost the immune system (hi Vitamin C!) and brain function and reduce inflammation! This 15 Minute Strawberry Peach Jam makes 8 oz of jam. Eat all of it. Give some to a friend. Eat all of it. Eat all of it. Eat all of it. Enjoy! If you like this recipe, you’ll love my 1 Pint Blueberry Jam. For more strawberry recipes, click here. Need more Summer recipes? Try my Peach Cake and Strawberry Soup! Put strawberries and peach slices into a food processor and pulse about 10 times until it's a consistency that is slightly chunky. Transfer into saucepan, add lemon juice and honey. Bring to a light boil on medium-high heat. Cook for 10-12 minutes, stirring often so it does not burn. Once it's reached a jam texture, remove from heat and let cool. Put into jar and store in refrigerator. Makes 8 oz of jam. SUMMER IN A JAM. Yummmm. Thanks Consuelo! This is definitely a summer time feeling jam! I wouldn’t have to worry about canning this to make it last…because I’m pretty sure I’d eat it all before it went bad! It’s basically bursting with summer! I know what you mean Joanne, I’m already plowing through that first jar! I love the simplicity of this jam. Quick, easy, flavorful. It is everything a jam should be. Totally agree Kim! Have a great weekend! I really had no idea how easy it was to make jam!!! Its really that easy? And, oh my word, I cannot get over how good strawberries and peach would taste together. This is plain amazing, Pamela! Go jam wild indeed! I love your very honey inspired jam recipe a lot!!. Yes please, 2 spoonfulls! 2 spoonfuls for you! Enjoy! I made a few jars yesterday & my husband & I love it so much! it is way better with honey then ordinary sugar!!!!!!!! So glad you guys enjoyed the jam! When I eat my daily pb+jam sandwich I will you guys a cheers! This looks awesome! I made jam today with autumn fruits and loved it. I love that this has no excess sugar in! High 5 for jammin friends! You’ve inspired me to make jam! I am looking forward to the weather this weekend too. Have a great one. Thanks Shashi! If you were closer I would be sharing this jam with you! Hey Amy, I’m in the actual segments – you can find some of my past videos for cooking and gardening on this site using the search if you’d like to! A little Bob Marley while making this jam is my kind of fun! I love the peach/strawberry combination! YUM. 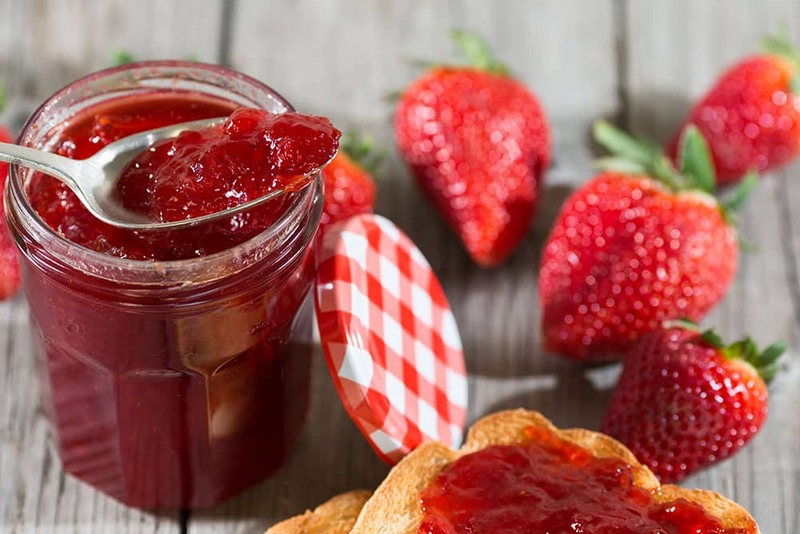 Oh yum, this jam makes me wish that summer wouldn’t end! Love that it is so easy to make too- perfect! YES!! I needed this one! This jam is exactly what I have been searching for; perfect timing!! Thanks for sharing this and have a great weekend! Why am I not your neighbor…this looks so good Pamela. I love making simple jams like this. Have a great weekend girl, mine is filled with entertaining friends, a festive week. Sounds like a great weekend – hope you enjoy it! You photograph the fruits very well and make them gorgeous! I wish I can smell these strawberries and peaches – and I can imagine it’s summer once I smell that! Thank you! I was having some photo troubles (it was getting dark) so your comment made me happy! Love your quick jam version! This is my jam! I mean… it could be. And it will be! Amazing flavors in this lovely jam, Pamela. It’s gotta get made in this house! Hope you enjoy it Georgia! I love the combination of strawberries and peaches! Thanks Anne! This is perfect for a small batch! This jam looks awesome! I love how it only takes 15 minutes and only makes a small batch. The process of making larger batches of jam takes soooo long. And we don’t really have anybody to give all the jam to in the end. haha! I also love how there is no refined sugar in this and no starch. It’s just perfect! Thanks Abbie! I love small batches because it means I can eat it all! Strawberries and peaches are a wonderful combination. 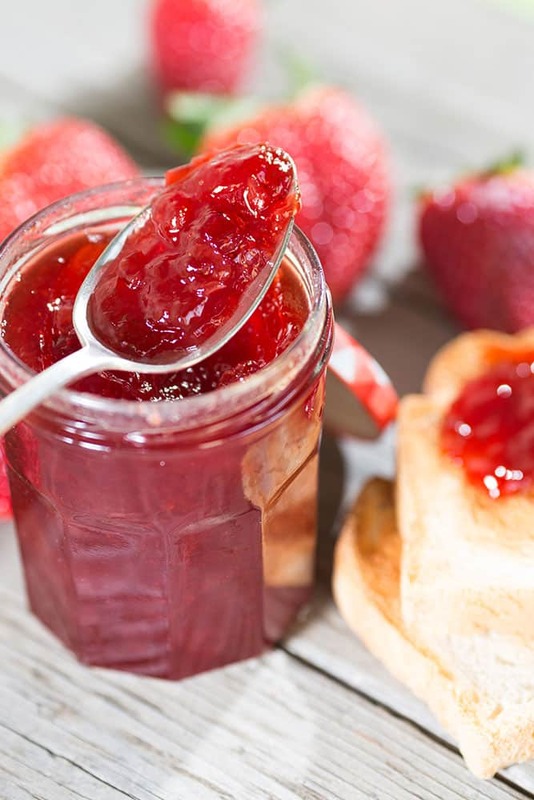 I love this easy jam recipe! Have a great weekend Pamela! Thanks Tessa! Hope you have a great one! Yes to the Bob Marley Jam soundtrack! This is also a good jam to listen to whilst cooking: http://youtu.be/S3UqvWk8-uw more of a slow-cooking tune. Love the pairing of peaches with strawberries. Imagine this on a scone, mmm! From now on when I’m stirring things up I will listen to that song! 🙂 On a scone, nom nom! Thanks so much Gretchen! Hope you and your family enjoy this jam! Love that it’s a quick 15 minute jam so the fruit still keeps its integrity. The combination of peach and strawberries is sensational. Thanks for stopping by! It smells great too! We are jam soul mates. I don’t can them because I hate stirring them forever and I want variety! I will NEVER throw out food if it can be helped at all. It makes me twitchy to see food go to waste. I made Chipotle Plum jam with 2 plums that were getting near death. I can’t wait to see the videos. My mom used to make strawberry-peach-banana freezer jam. I haven’t thought about that in a long time nut remember is being delish. Love the one pint ideas. Thanks Debra! I’m always down for a quick jam! Jams that are quick and easy is the only kind I make. 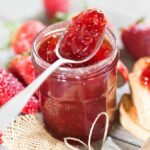 I love a good homemade jam and this looks so easy and delicious! Hope you get to enjoy some before Summer ends Julia! Ya know, like a dope, I’ve never thought to make a strawberry AND peach jam. It sounds divine, Pamela! Great inspiration, thank you! Can’t wait to see the videos!! I literally love anything peach, but homemade strawberry peach jam…seriously, does it get better than that!? It’s yummy! I’ve been eating it on bread and crackers every single day! I love this recipe as I know it works! 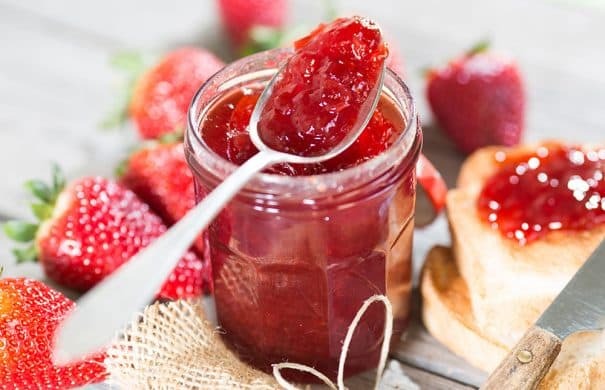 I have never made jam, but I really want to try soon! This looks fantastic! Thanks Ashley! Hoping you had a great one too! Have I even tried to make jam yet? In all the years I’ve been blogging have I even tried? I LOVE. Summer goodness, jarred for safekeeping. The pesto was so good I had to try making something else. We just missed peach season, but I’m up to my ears in blackberries. So I made it with a few blackberries and a splash of vanilla extract. Oh my goodness it’s delicious! My husband and I shamelessly demolished the first batch yesterday and today we made round two. Thanks for the wonderful recipe!! Blackberries sound amazing, swooning at the thought Lauren! Thanks for letting me know!